I used Handy to spray acetochlor pre-emergent herbicide in my hectare of maize. It took me almost 1 hour less to spray a hectare using the applicator compared to my knapsack sprayer. I used 1 litre of acetochlor in 20 litres of water which was not completely exhausted after spraying the plot. When I first looked at the amount of water (20L) and the size of my field to be sprayed, I doubted if the applicator would do a better job. 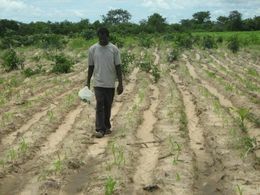 But now I am convinced; I cannot see any weeds competing with my crop. This is the best applicator to use. I managed to do the job in a very short time without difficulties or getting tired. 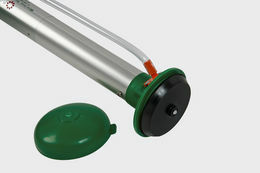 The Handy is a hand-held spinning disc sprayer for the Controlled Droplet Application (CDA) of herbicides. It can apply CDA formulations or traditional water-based products at total spray volumes of only 10-30 litres/hectare. 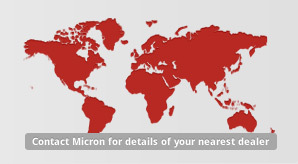 The consistently large spray droplets of around 250 microns minimise the risk of spray drift. Spraying behind the operator ensures maximum operator safety in use and the advanced ergonomic design eliminates the need to carry spray liquid on the operators back (which also minimises operator safety risks). 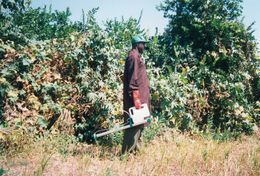 The Handy is used for the application of post and pre-emergent herbicides in row crops such as cotton, sugar cane, groundnuts, sisal and maize. 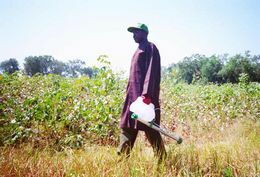 A hectare can be sprayed in 2 - 3 hours. 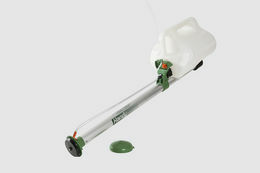 Robust aluminium handle and and simple to maintain spray head.